I've gone through 5 or 6 mechanic shops that I've been to and Olsen's is the only one I use now period. I have recommended them and I recommend them to my employees. I think it pretty much says it there. I can communicate with them. We have a great system set up where my cars go in, they call me and tell me what's wrong and what the estimate is to fix it. The key is, I'm not surprised. I like doing these things ahead of time. I like doing these things ahead of time. Also I ask them to save any parts they've changed out for me. They do that and that way I know I'm not being misled. I'm happy with Olsen's. I just have a confidence there. I think I'm being treated fairly there. They're my favorite repair shop. They're extremely helpful and able to tell you exactly what's going on with your vehicle so you know what they're going to be doing. They are extremely honest. I would trust them with all my vehicles and I would also recommend them to neighbors and friends. They've always done excellent work. They fix my car exactly how it should be fixed without any difficulty. If there is a problem, they will tackle it and fix it. They are over the top exactly the way a business should operate. They satisfy the customer. I always like Olsen's. I've been dealing with him for a long time and have nothing but good things to say. You can't go wrong using them. They have longevity in the area. They offer quality service. Their attention to detail speaks for itself. It's a no-brainer to go to them. They are local and reliable. They are very convenient to use. They know what they're doing. They're not the cheapest, but they do good work. For the things that matter, they're the ones to use. I recommend them to others. 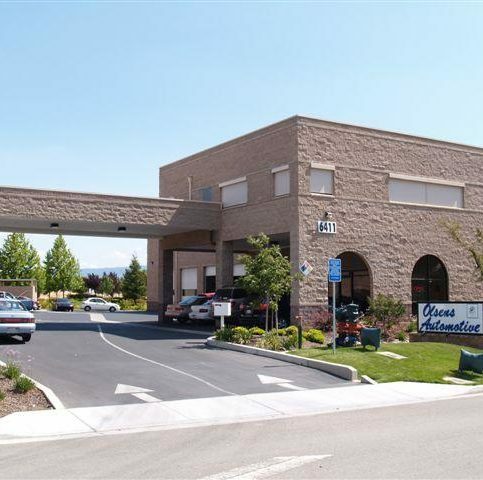 Olsen’s Automotive Repair provides general maintenance and repair services for Alameda and Contra Costa County drivers. 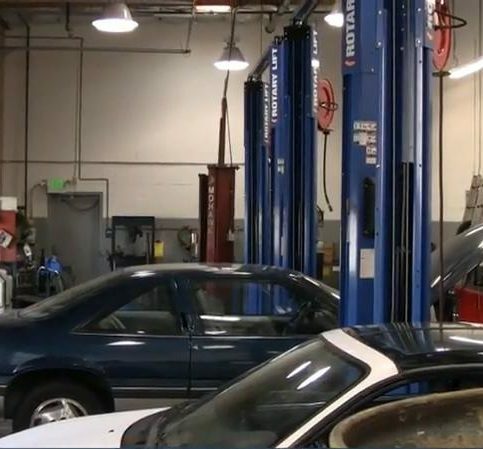 The Livermore-based shop specializes in American and Japanese cars (with an emphasis on Toyotas) and handles everything from oil changes and regular maintenance work to brake, timing belt and clutch replacements. Olsen’s also sells most brands of tires. 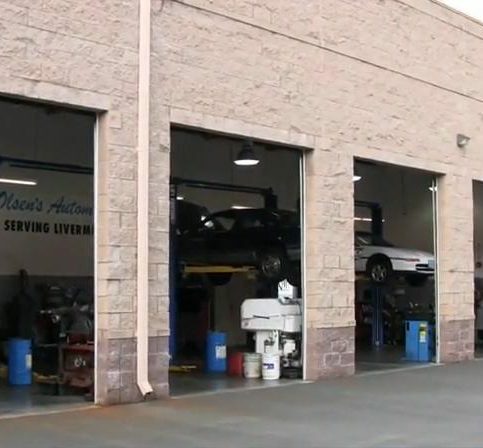 Since taking over sole ownership of Olsen’s Automotive Repair in 1993, Lyde Waitley has worked hard to maintain the company’s reputation as a first-rate repair shop committed to offering the highest levels of service, workmanship and trustworthiness. Mr. Waitley has more than 40 years of experience in the automotive industry, and he’s joined by his daughter and business partner, Cynthia Waitley-Tinkham, who is the office manager. Olsen's Automotive Repair also does oil changes. 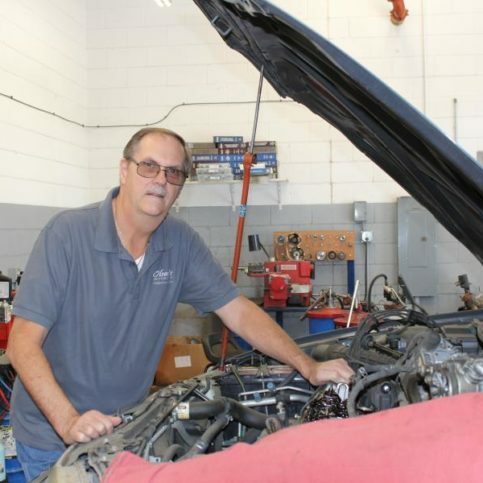 Since taking over Olsen’s Automotive in 1993, Lyde Waitley has worked hard to build the company’s reputation as a first-rate repair shop committed to the highest levels of service, workmanship and trustworthiness. 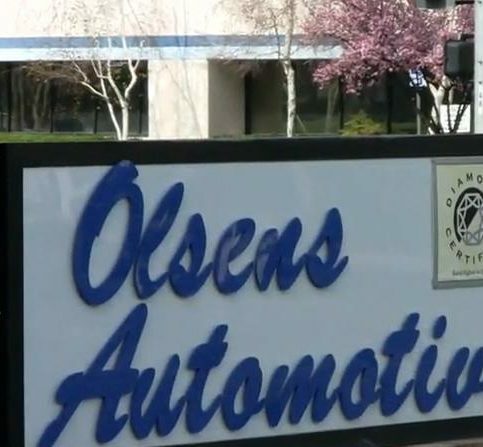 Olsen’s Automotive is vigilant about keeping pace with new technology. Their state-of the-art equipment allows them to diagnose and service any make and model of car. Their objective is two-fold: Repair your car now and perform preventative maintenance that will prevent costly problems down the line. From his modest beginnings pumping gas as a teenager, Lyde Waitley went on to apprentice in an automotive union. He is now a Toyota Master Technician with over two decades of experience. All technicians in his shop are also ASE certified. Olsen’s Automotive is a family affair. Lyde Waitley’s wife, Jean, works in the office handling the books. She is also credited with creating a service that shuttles customers to and from their homes and work, keeping inconvenience to a minimum. Being a family business matters deeply to the Waitleys. They believe their customers appreciate dealing with someone whose dedication to them and their community runs deep. Every customer knows to expect outstanding treatment, for their cars and for themselves personally. Mechanics may be experts, but they shouldn’t talk over your head. Visiting a mechanic often brings on feelings of insecurity and even helplessness. You need find one you can trust—a mechanic with whom you know you’re not being taken advantage of. You can lessen the anxiety by choosing a mechanic who communicates on your level, says Lyde Waitley of Olsen’s Automotive Repair. Waitley suggests you pay close attention to the mechanic’s listening skills. Good mechanics listen and ask questions before making a diagnosis. Plus, they often have a knack for explaining repairs in terms that make sense even to customers with no mechanical or vehicle knowledge—often by using analogies to illustrate the work needed. Though your first priority is finding a highly skilled and honest garage, most people also find themselves drawn to mechanics that are personable and helpful. Follow your instinct, says Waitley, and show preference for a mechanic who gives you that “good feeling.” In fact, he suggests you visit a mechanic or two in your area before you bring in your car. Describe your problem and ask them how they would address it. “Do they make time to talk to you? Do they make you feel important?” he says. If not, he suggests, keep looking. Q: How long will a tune-up take? A: It really depends on the type of the vehicle and the mileage. Many factors come into play. But generally, about two hours. Q: What if I’ve been in a car accident? A: We’re not a body shop, but if you want to keep driving the car without fixing the damage, we can evaluate whether it’s possible to get the car back on the road legally with only minimal repairs. Q: I’m waiting for my car to be fixed. Do you have a waiting area? A: We’ve got a pleasant waiting area, including a couple of leather chairs with guest reading materials. Q: What about loaner cars? A: We can arrange a low-cost rental through our relationship with Hertz car rental agency. A: Oil change intervals depend on the type of driving the vehicle is subjected to. Short-distance driving is the worst. The oil never gets hot enough for long enough to evaporate the contaminants that build up. We suggest a minimum of three oil changes a year to protect the internally lubricated parts of your engine from the ravages of sludge. 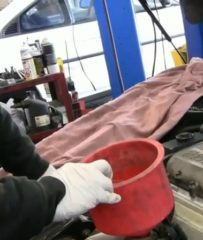 Oil is cheap, and major engine repairs are not; three oil changes cost under $100.For vehicles driven long distances regularly, change your oil every 3,000 miles. Synthetic oils last longer than conventional oils, but cost more. A: Rotate tires at every 5,000 to 7,500 miles. Sooner is always better. Tire wear patterns should be closely inspected at this time to see whether an alignment or tire balance is in order. This can greatly increase tire life. Q: Should I stop immediately if my check engine or service engine soon light comes on? A: Not in most cases. However, if you notice a change in the way the engine runs, such as a hesitation, surging and jerking, or stalling, stop as soon as you safely can and get the problem checked out. 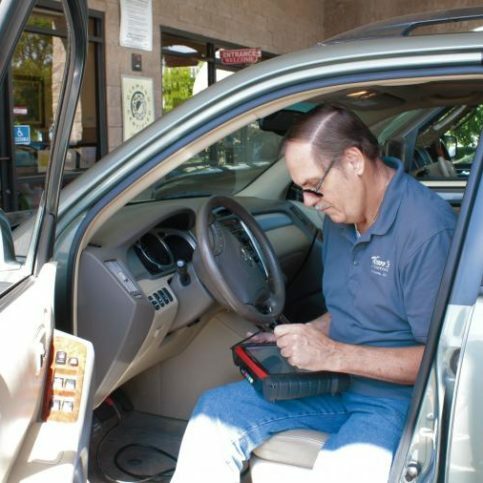 LIVERMORE — A common thing seen by auto technicians is infant and child car seats that have been installed incorrectly. While some drivers might assume a cursory installation is good enough, the reality is that even a child who is completely restrained can be injured in a collision if the car seat is improperly installed. In many cases, it’s fairly easy to tell if a car seat isn’t installed correctly. The most obvious sign is if it moves a lot, either up and down or side to side. In contrast, a car seat that’s properly installed will be almost completely stationary. To assess the quality of a car seat installation, simply jostle the seat a bit—if it moves around a lot, it needs to be tightened. If you’re having trouble getting a car seat adequately tightened, try putting all of your weight on it; this will provide both better leverage and more give to the tightening strap. If you have any doubts whether the installation of your infant or child car seat is correct, please contact your local fire or police department to set up an appointment for a free safety inspection. Your child’s life may depend on it. LIVERMORE — Host, Sarah Rutan: If your child is in a carseat, you’ll want to make sure it is properly installed. Today, we’re in Livermore with Diamond Certified Expert Contributor Cynthia Tinkham of Olsen’s Automotive Repair to learn how to ensure car seat safety. Diamond Certified Expert Contributor, Cynthia Tinkham: Over the years, I have seen many cars come in with improperly installed infant and child car seats. An improperly installed child car seat will have too much movement either up or down or side to side. They should not be able to move like this. A child that is restrained in their car seat, even if they are in there properly, still can get injured due to an improperly installed car seat. When an infant or child car seat is properly installed in any vehicle, you should not have any movement from the car seat. It should stay stationary. It should not move up, down, or side to side. If there’s any doubt about the proper installation of your infant or child car seat, please contact your local fire department or police department. Generally they have clinics or set up appointments. Your child’s life depends on it. Lyde Waitley is a lifetime veteran of the auto repair industry and owner of Olsen’s Automotive Repair, a Diamond Certified company since 2002. He can be reached at (925) 386-6937 or by email. Following high school, Lyde’s auto repair career was put on hold when he was drafted into military service during the Vietnam War. After returning, he went to work for a Toyota dealership, where he would be employed for the next 20 years. 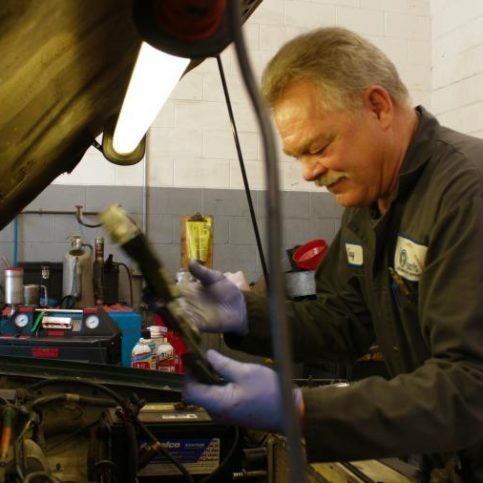 By the time he opened his own repair shop in 1990, he had earned the distinction of being both an ASE- and Toyota-certified master technician. Two decades later, Lyde’s expertise continues to benefit customers at Olsen’s Automotive Repair. A: I’m a huge country music fan. Some of my favorite artists are Reba McEntire, George Strait, Kenny Chesney and Martina McBride. A: A lifetime NRA membership. A: Back when everybody had a CB radio, people used to call me “High Pockets” because of my height. A: Peanut butter on toast. Q: What’s the biggest animal you’ve ever hunted? 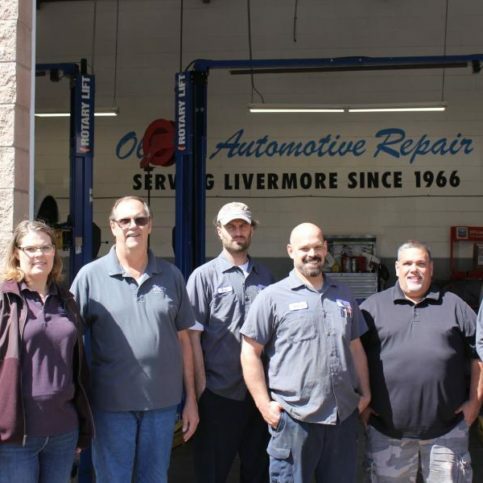 LIVERMORE — While some aspects of vehicle maintenance require the expertise of an auto technician, there are a number of things you can keep track of yourself. To ensure safe driving throughout the year, there are three main areas to address on an ongoing basis: visibility, fluid level and tires. Visibility is a crucial aspect of safe driving, which is why it’s important to address related vehicle components like headlight lenses, windshields and windshield wipers. The performance of headlight lenses can become compromised as their UV coating breaks down, so it’s a good idea to have your lenses polished and the UV coating reapplied periodically. Windshields with large cracks should be replaced as soon as possible, especially if the crack directly obstructs your visibility, which can earn you a ticket. Additionally, you should replace windshield wipers regularly, as their performance starts to diminish with increased wear. You can prevent engine problems by regularly checking fluid levels, particularly engine oil and radiator fluid. To check your engine oil, remove the dipstick, wipe it off, re-insert it and take it out again to get a more accurate reading (also, make sure you’re parked in a level area). Most dipsticks have a full mark and a low mark, with a one-quart difference between them. To avoid overfilling, add oil when you’re a quart low, not before. 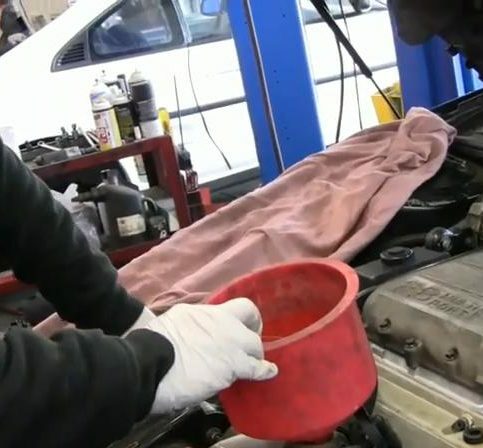 While engine oil is best checked when the engine is still warm, radiator fluid should only be checked after the engine has cooled down, as removing the radiator cap of a hot engine can be a safety hazard. Tires should be inspected regularly for proper inflation, as well as signs of adverse wear such as cracking. Set tire pressure to the vehicle manufacturer’s recommended level, not to what’s printed on the tire itself—that figure is actually an engineering specification for the structural integrity of the tire and shouldn’t be referenced when setting tire pressure for normal driving. 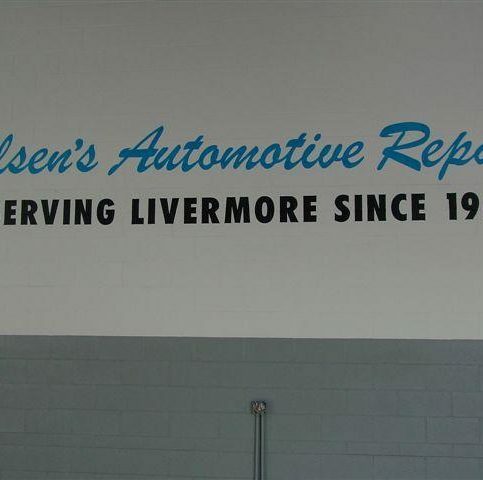 LIVERMORE — Host, Sarah Rutan: To ensure safety while on the road, you’ll need to know how to properly maintain your vehicle. Today we’re in Livermore with Diamond Certified Expert Contributor, Kenneth Waitley of Olsen’s Automotive Repair to learn a few tips for vehicle upkeep. Diamond Certified Expert Contributor. Lyde Waitley: There are many things that the consumer can check on their own on their vehicles on a regular basis to ensure safe driving through the seasons ahead. This is an example of a badly weathered headlight lens. When the lenses get like this, the UV coating breaks down, and it has a significantly adverse effect upon nighttime visibility. These lenses can be polished out and the UV coating reapplied for safer nighttime driving. Cracked windshields should be replaced when they’re first observed. The most critical time is when you have a crack or other deficiency in what’s termed the acute area of the windshield, which is what the driver looks through during normal driving. When the damage is in this area, you can get a ticket from law enforcement. Windshield wipers should be replaced when they’re torn, such as this, or when they get so worn that they chatter when you’re driving in rainy weather. Consumers can prevent many problems by regularly checking the fluid levels in their engine. The first to be checked and to be cautious with is the radiator. This should only be open when the engine is completely cold to prevent burns to the person doing the inspection. Never trust the overflow bottle only to judge the level. This can be full, but the radiator itself can still be low resulting in overheating and engine damage. Next, we want to check the engine oil. It should be checked when the vehicle is parked on level ground, and you wipe it off first and then stick it again and observe the level. Most dipsticks have a full mark and a low mark. The difference is usually one quart. Add when you’re a quart low, not before, because you may overfill it. Inspecting the vehicle’s tires is another thing the consumer can do on his own to prevent safety issues. Tires should be inspected regularly for proper inflation, for adverse tire wear, and cracking anywhere on the tire, especially on the sidewall which can indicate advanced age. The tire pressure should be set at the vehicle manufacturer’s recommended pressure as opposed to what the tire specifications says. That specification is simply an engineering spec for the structural integrity of the tire and should not be used to set the pressures on the vehicle. Olsen’s Automotive Repair : Average 9.2 out of 10 based on 500 unique customer surveys of customer satisfaction. They are knowledgeable and they're friendly and they get the job done. And they stand behind their work. They are always top-notch. I strongly recommend them. They have quality, honest service. Quality, and they don't try to give you the runaround. They just tell you what you need. They were fairly quick, and they were professional. I think they did great all around. They provided good service and it was clean and it was a very nice shop. They were professional and polite, so it was a good experience. I would say it is a trusted place to take your vehicle for repair. The quality is the most important aspect, that they get the job done right the first time. They're good. They're fair. And they take care of you. They are knowledgeable and they don't tell you stories about what might be wrong. They are good. They're the best in the trade. They are absolutely my go-to person repair shop. I used to go to the dealer, but Olsen's is better, faster and cheaper. It's easy to get in to see them. They know what they're talking about. They do timely, quality work. I'm very satisfied with their work. They're honest and they work hard. They're friendly and easy to talk to. I would tell others to go there and not to bother with anybody else. They're friendly and very helpful. I feel like they bend over backward to take care of you. They're honest and always helpful. The appointments are on time. The car is always ready when it's supposed to be. They do good work. They have good coffee. They're great and they always try to help you with the best price they can give you. I like the way they treat their customers. I really like Lyde and Cynthia. They are always very kind and very helpful. They've always done right by me. I trust them. I like that they are Diamond Certified. They are knowledgeable. They are very nice. When I didn't have a car, they came and picked me up and took me back. Everybody's nice. They do good quality work. They seem like they know what they're doing and they want to make everybody happy. I feel like they're really good. I really like them. They are very honest, and they always do a good, thorough job. I like that they offer coffee. They do quality work, and they are professional. They had a good price, and they stuck to that price. I like that they are close to my house. I haven't thought that much about it. They are very polite, I guess.